These Are Some Of The Best Berlin Attractions in the City! Looking for the best Berlin attractions? Any new visitor to the German capital is! 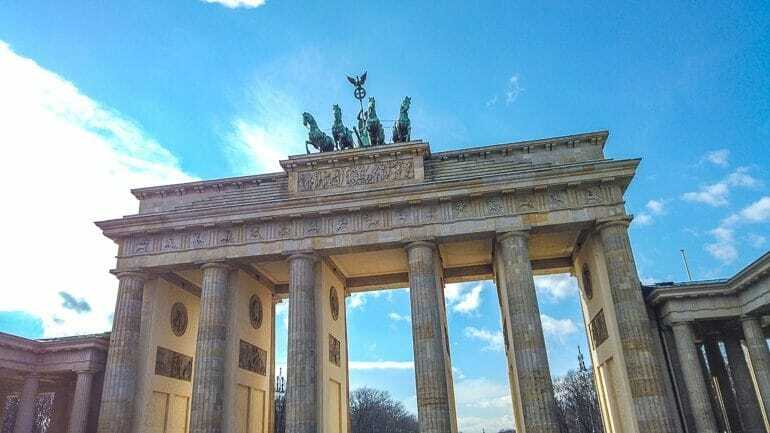 If you are heading to Berlin for the first time and trying to fill a few days (from 1 day to 3 or even more), you’ll need a list that brings together some of the classic Berlin attractions in one place. Whatever the time of year you are visiting, there are plenty of things to do in Berlin to keep you busy during the day or at night! We’ve played tourist in Berlin more than once by now. Eric first stopped through Berlin on his classic Europe itinerary years ago. Lisa had been before a bunch of times (being German). Funny enough, Berlin is actually the first city where we met in person. 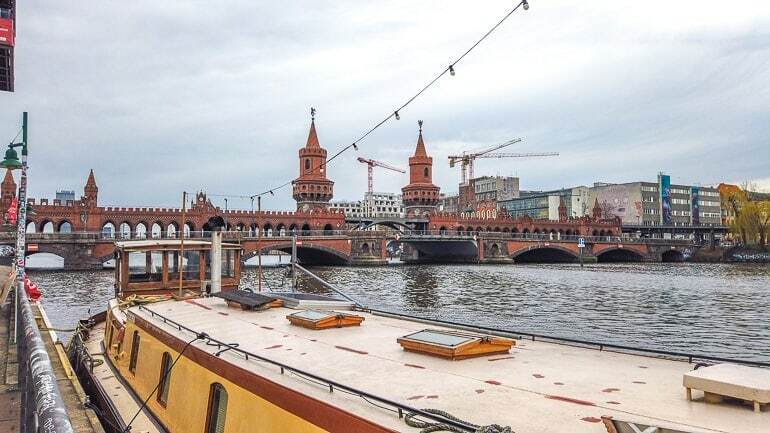 As for you, the best way to see Berlin is through its history – and many of the top Berlin attractions make a point of guiding you on a journey of learning about it. So, grab a Berlin attractions map and check out our Berlin list – think of it as a “Top 10” except with a few more additions! Check Out Hidden Gems Like Würzburg and Bamberg! Some Useful German Phrases to Help You Out! If you want to get a first impressions of Berlin and some of the beautiful attractions it has to offer, then watch the video snippet below. You can find the whole video on our YouTube Channel here. If you are planning a trip to Berlin, here are a few things that you should know before you set off exploring. We thought it would be helpful to cover things like history, language, weather, transportation, accommodations, and more! You might already know this, but Berlin is the capital – and the largest city – of Germany. We could tell you all about the history of Berlin but WOW would be a very long blog post. In short, the city has MANY rich historical sights from both good and darker times over the 19th and 20th centuries. The city was even divided up after World War II and was physically divided by the Berlin Wall. 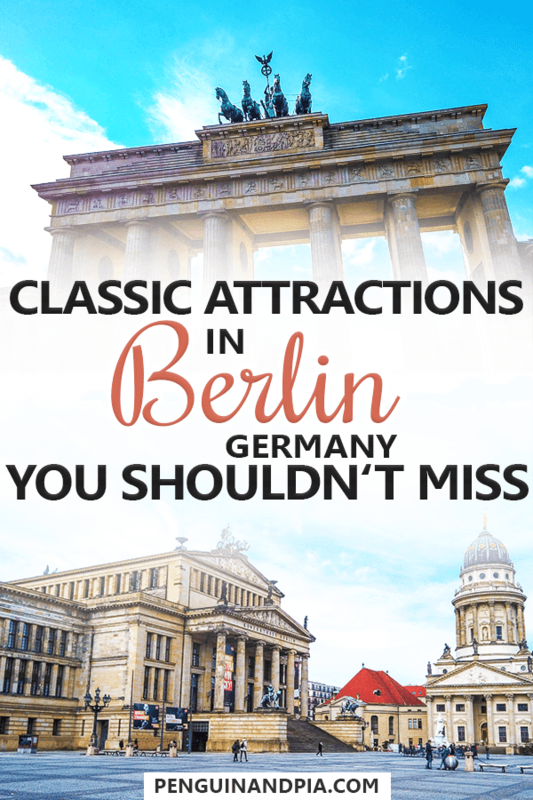 You can definitely learn about this when you are there exploring places and checking out exhibits like the East Side Gallery, Checkpoint Charlie, the Reichstag, and more. We will tell you all about these below! That said, it’s important to remain open-minded and respectful about the German past. It can be a sore spot for Germans even to this day. 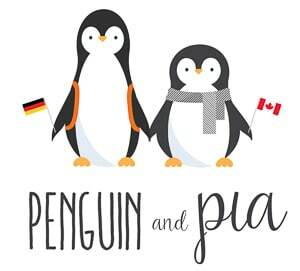 The language spoken is German but English can be found at many of the top attractions and restaurants in the city. Just so you know, the money used in Berlin (and Germany, in general) is the Euro. This makes travelling around other parts of Europe easier – but you’d be surprised how many different currencies you may run into! The best time to visit Berlin definitely depends on the activities you wish to do and the size of the crowds you are looking to face. It should come as no surprise that the summer months from June to August are warmer – but there can also be very large crowds at many of the top attractions. Lots of the top attractions are enjoyed outdoors – so this is important to consider. Berlin doesn’t get crazy cold in the winter time – the temperature hovers around 0 degrees Celsius. However, those months bring with them wind and rain with occasional snow. If you book a Berlin walking tour, they usually run in rain or shine but have reduced tour times in the winter season. However, during the winter there are classic German Christmas markets to enjoy in Berlin! So with all that in mind, if you are flexible, we’d suggest the spring for travel – April and May – before the crowds get too crazy. If you need help with packing, here’s our packing list for Europe! The Oberbaum bridge is a popular route for S-trains and walking! As for getting around Berlin, you have loads of options. 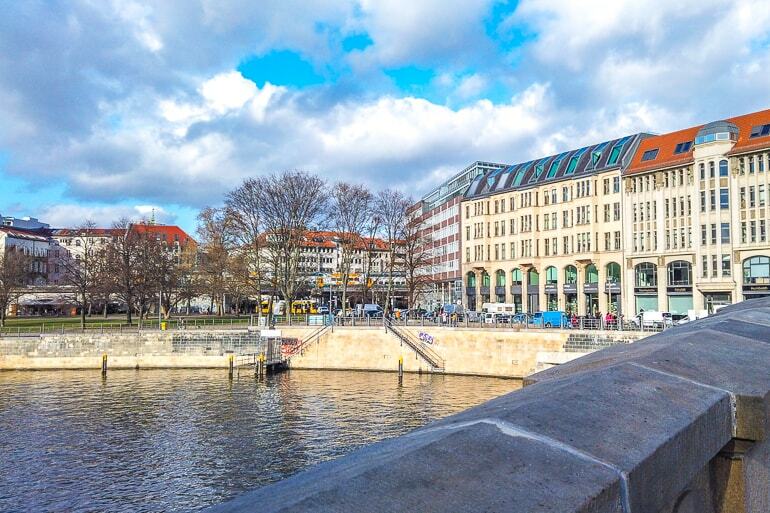 It’s easy to walk to top attractions when you are in the city centre (Berlin Mitte). That said, Berlin is very large and spread out pretty well. You’d get tired of walking after some time – and you’ll need your feet to explore the attractions once you get to them! Berlin has a pretty good transport system for you to use. It’s made up of four main ways to get around: subway (called the U-Bahn), street trams, buses, and S-Bahn trains (overground metro) to use. If you want to use public transportation, you can check out the different options for tickets/passes here on the BVG Website. You could also get a taxi if needed, we suppose. You might consider a Berlin walking tour to get your bearings and learn about what you want to return to later. The Berlin WelcomeCard is a Berlin transit pass (super helpful) which offers discounts on top attractions – and comes with a guidebook! You can take a bike tour around Berlin to get a local vibe and some exercise with a knowledgeable guide. You could also buy a hop-on hop-off bus tour and use it as a way to get between top attractions in Berlin. Just an idea! We’re not going to cover this topic in-depth here because we are going to write a whole guide on where to stay in Berlin soon. That said, there are also lots of great districts to stay in with a variety of hostels and hotels to suit everyone’s budgets and needs. We’ve stayed at a bunch of places across the city and liked each of them for different reasons. If you want to get started, check here for Berlin accommodations. As for hotels, check out Meininger Hotel Berlin Central Station which is located just outside of Berlin HBF. The area outside this station (contrary to what you might think about train station areas) is very developed and busy with travellers. If you’re looking for hostels, we recently stayed at Alcatraz Backpackers Hostel and really liked the private room, laid back vibe, and the overall area in the city’s north end. In another post on the ultimate Europe itinerary, we talked about PLUS Berlin which Eric really liked and is very popular. It even made our list of favourite hostels to stay at in Europe! Okay, so now that you have all the information – let’s dive into some of the best things to do in Berlin! These Berlin attractions are in no particular order so have a read through to decide on what you want to see and do! The Brandenburg Gate is loaded with history. No visit to Berlin is complete without a walk to (and through) the Brandenburg Gate. Built in the 18th century, this neoclassical monument is not only pretty to look at – but it has served a few important functional purposes over the centuries. The gate itself was used as one of the entry points into what is known as the Berlin Customs Wall. This is different from the Berlin Wall – which actually went around the gate at the time it stood! The gate is located in the city centre – right on the square known as Pariser Platz. It’s a popular gathering area for photos and many walking tours start here if you are looking for one. You can also visit the Brandenburg Gate Museum right beside the Gate on the square. As one of the most recognizable monuments in the world, you should definitely check out the Brandenburg Gate! “My God, Help Me to Survive This Deadly Love” – one of the most famous of paintings on the wall. One of the top attractions in Berlin is undoubtedly the Berlin Wall. This barrier – erected in August of 1961 – fell physical and symbolically in 1989 and effectively leading to a unified Germany and the start of the end of the Cold War. Today, the wall is of the most universally recognized symbols in the world. You will come to realize that there are a few places across Berlin where you can still experience the Berlin Wall still standing. While we name some below, we’d suggest that you check out the portion known as the East Side Gallery. 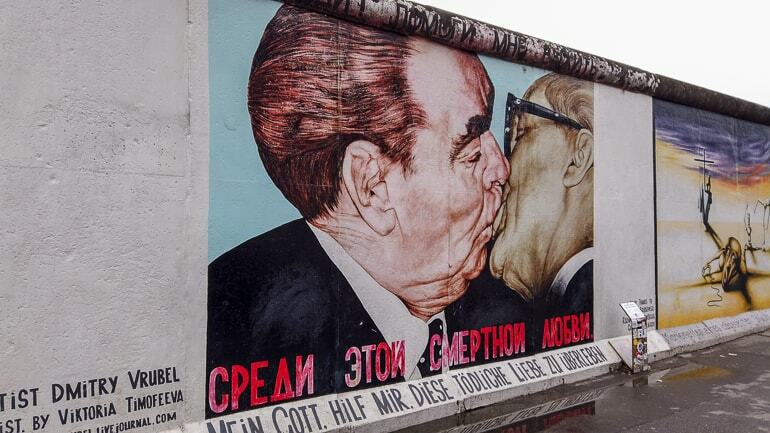 The East Side Gallery is a 1.3 km long stretch of the Berlin wall that is still standing in the East end of Berlin. Artists were brought in over the decades to paint sections of the wall with murals about – well, pretty much everything. The result is a stunning mix of street art that is moving and fascinating. To get there, you can take the S-Bahn to Berlin Ostbahnhof or Warschauer Straße (which is S and U bahn). You can’t miss the wall from either one. We have both been fortunate enough to visit the Gallery multiple times now and each time the experience is still worth the trip. If you want to learn more about the history and plan your visit to the East Side Gallery, check out the official Visit Berlin site. The Reichstag with the beautiful glass dome you can climb! Located just a block north of the Brandenburg Gate you can find one of the most iconic buildings in all of Germany – the Reichstag! 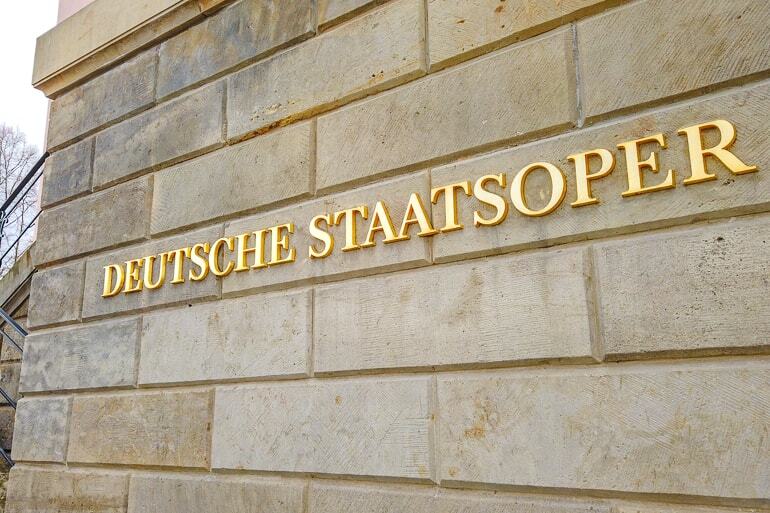 Originally built starting in 1884, the German Parliament building has seen its share of struggle over the years. The Reichstag was damaged and partially destroyed both by fire (1933) and then by the events of World War II and the Battle of Berlin. Today, it serves to house the German Parliament (Bundestag) and you can enter it and take a tour. If you want to visit, you have to pre-register your details to clear security for the day you wish to visit. One of the most visited elements of the building is the iconic glass dome that was constructed on the building’s rooftop. The structure replaced another glass atrium that stood there over the decades. Now, you can actually walk inside it and up ramps as you learn about the building and the city view below! 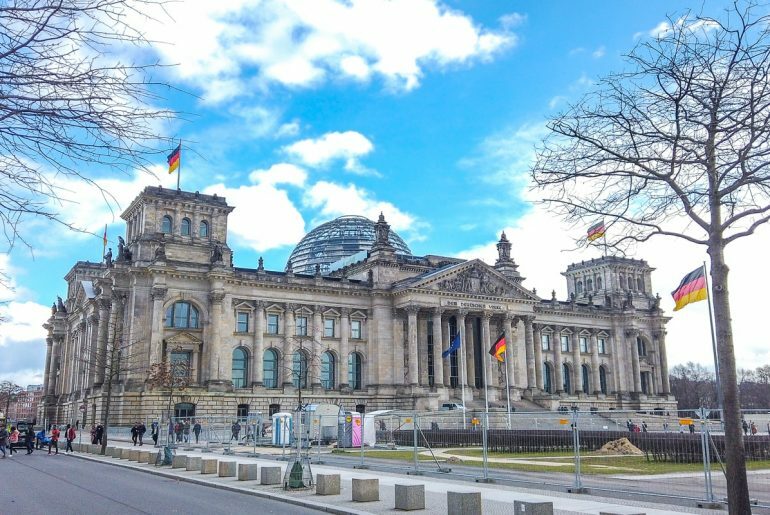 Since the line ups can get pretty long (we’ve both been and it was definitely a popular attraction), you might consider a line skip ticket and live tour of the Reichstag Dome. If a tour isn’t enough for you, you also have dinner and/or a coffee up on the roof at the beautiful rooftop restaurant! If you want to visit the largest palace in Berlin, then you need to head to the west end to Charlottenburg Palace. Built back at the end of the 17th century, this royal palace was much smaller and more modest. Over the years, it expanded and changed architectural/design styles to include baroque and rococo. It was badly damaged in World War II but has since been reconstructed. Today, you can visit the palace and grounds for a fee which includes interior rooms, the gardens, and many smaller structures like the Belvedere and the Orangery. In the winter, they hold Christmas Markets on the grounds which draws in huge crowds. If you are looking for more than just a visit, consider a tour, dinner, and a concert in the Palace! The unmistakable domes of the Dom! Adding to the theme of “buildings that have changed over the years in Berlin” is the Berlin Cathedral. Fun Fact: it’s not actually a cathedral AND the long form of the name is actually the Evangelical Supreme Parish and Collegiate Church! In German, you may see it referred to as the Berliner Dom. First built back in 16th century, the famous church on Museum Island (we will dive into this area below) was built in its current version in the early 1900s. Inside, you can find a gorgeous interior and one of the largest pipe organs in Germany with over 7,000 pipes! If you want to enter the Dom and take a tour or attend prayers (since it is an active place of worship), you can learn more about prices and times here. Once inside for a fee, you can visit the interior, the museum, the crypt, and get views from the outer Dome walkway! As you gaze over the Berlin skyline, from time to time, you might see a silver ball on a spire gazing back at you. 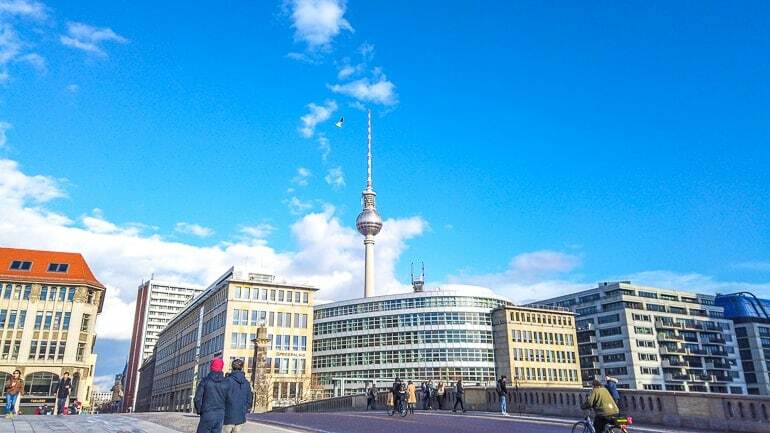 That’s the Berlin TV Tower – or Berliner Fernsehturm in German – located at the very famous public square Alexanderplatz. The square is full of shops, restaurants, and a few other attractions which you can check out. It’s also a popular transit hub with many modes of transport passing through. Built back in the 1960s, the TV Tower was meant to stand as a symbol of Communism over the then-divided Berlin. Today, you can visit the tower, learn about its history and the history of the city below with amazing views from 203 metres above the ground! The observation deck is one thing – but there’s even a bar/restaurant up there that rotates! If you want to visit, skip the line, and make a table reservation for dinner overlooking Berlin – then you should definitely check out this ticket. We went up the tower a few years back and it was pretty cool. Admittedly, we went at night which made the light of Berlin cool to see but we kind of missed the views of the city during the day time. If you want to learn more about the tower, you can do that here. Wander through the memorial – and please be respectful when you do! You cannot go around Berlin without finding constant reminders of the past – both positive and negative. Just south of the Brandenburg Gate, you will find one such reminder: the Memorial to the Murdered Jews of Europe. This outdoor memorial consists of over 2700 concrete “stelae” of various heights. There are many reasons and interpretations for the design – one of which is that you are supposed to feel disorientated among the tallest ones at the core much like Jews did during the Holocaust. In any case, you can wander the grounds for free. There is even an exhibit underneath the memorial with more information and details about this point in history. Admission here is also free – but it has opening and closing hours. You can learn more about the information centre exhibit here. 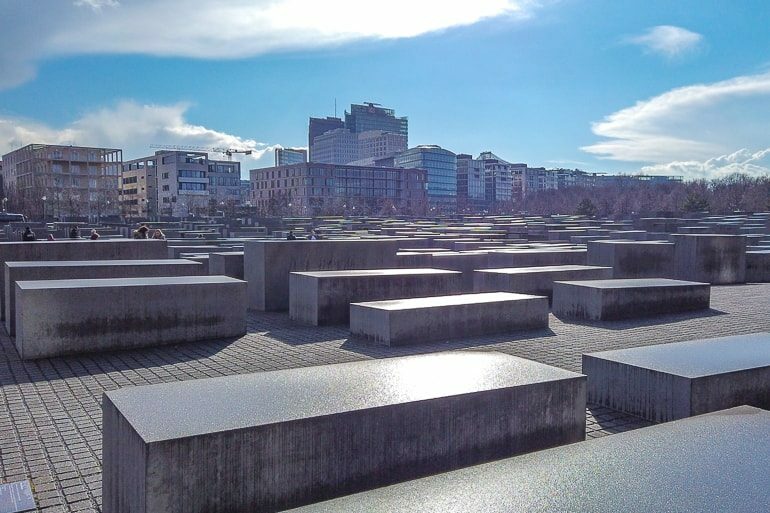 If you want to learn more about just the city’s history with regards to Nazi Germany and the Third Reich in Berlin, you can also go on a Third Reich Tour around Berlin. Eric went on a walking tour that incorporated loads of history and it was really fascinating. 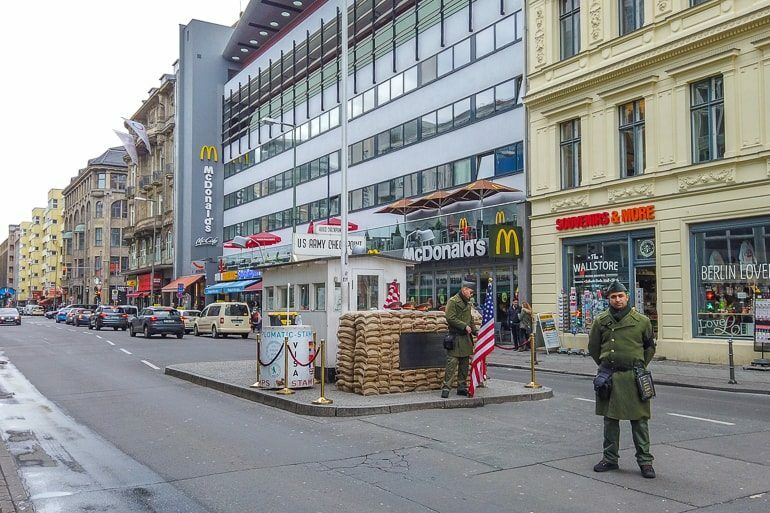 If you head there today, you might not feel the tension that was present during the Cold War – but “Checkpoint Charlie” remains, to this day, one of the most visited attractions in Berlin. This tiny white guardhouse on Friedrichstraße served as one of the entry points dividing East and West Germany during the Cold War. The name Charlie was given – of course – in accordance with the NATO alphabet as the third border crossing opened by Allied forces. Today, visitors can walk freely from one side to another – there is a cobblestone line where the border once was and plenty of opportunities to take photographs. Nearby, there is also a museum called the Wall Museum (Haus am Checkpoint Charlie) where you can dive into the history of the location and the city. Lisa has been to the museum a few years ago and remembers it being quite interesting. If you want to learn more about visiting the site and the related museum, you can do so here. Known in German as Großer Tiergarten or just The Tiergarten, the park in Berlin’s centre is the largest in the city and one of the largest urban parks in the whole country! With paths crossing in all directions leading to various important landmarks or squares in the city, it’s no wonder people get lost in there. Besides expansive green space, in the park you will find many statues and monuments – including the Victory Column (which we talk about below) and the Soviet War Memorial. We got to hang out in the park for New Year’s Eve celebrations the first year we travelled together. Between the fireworks and the music, and it was definitely a night to remember! The Alte Nationalgalerie looking gorgeous as always. 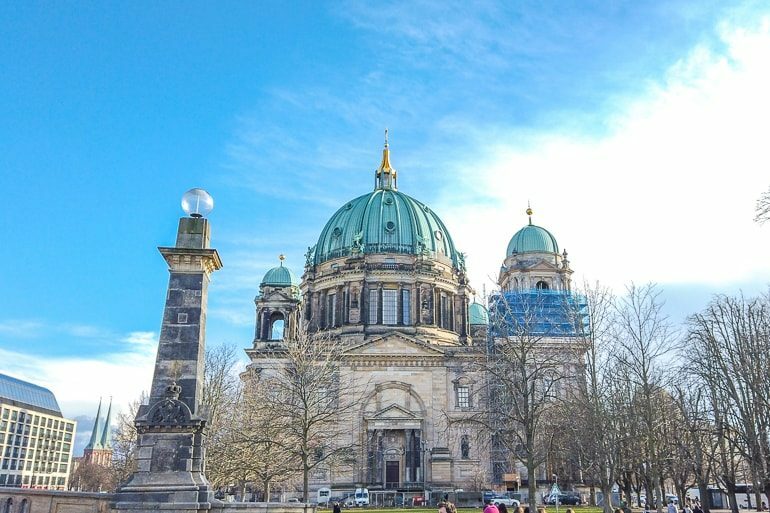 If visiting museums and galleries is more your thing, then you will need to head to Museum Island – an island that is home to multiple different museums! Located at the end of Unter den Linden basically opposite the Brandenburg Gate, the island also has the Berliner Dom on it. Besides offering visitors a great green space for photos in front of the Berliner Dom (Lustgarten), the island in the middle of the River Spree is absolutely jam packed full of museums to check out. 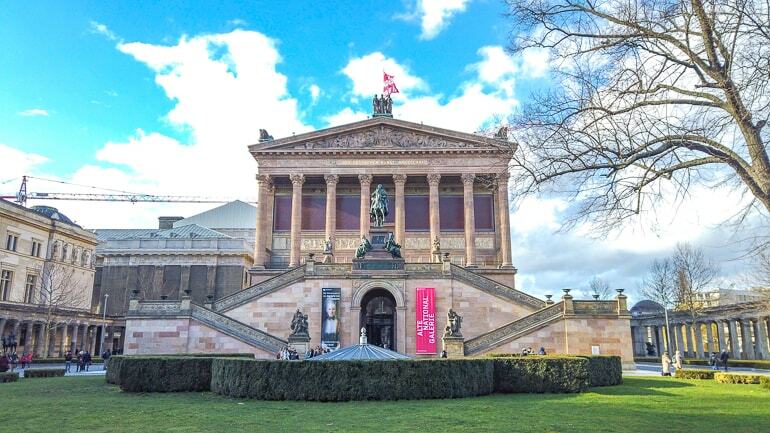 In no particular order, you can find the Pergamon Museum, Alte Nationalgalerie (shown above), Neues Museum, Altes Museum, Bode Museum, and even more attractions! If you want to visit as many museums as you can while in Berlin, then this ultimate Berlin Museum Pass might be perfect for you! The Hackescher Markt area is just over there by Museum Island! If you want to get in a bit of shopping, grab a bite to eat, or go cafe hopping, then head to Hackescher Markt! This popular area (and public square) is also a busy transit stop making it super easy to get to and from anywhere in the city. The area itself is located just to the northeast of Museum Island on the other side of the River. You can learn all about the area and what shops await you here. The area is also popular for walking tours to leave from since it’s central/north in the city centre and close to many of the top attractions. Here is a Berlin walking tour that leaves from Hackescher Markt, should you be interested! It’s also a great area to stay near with that many cafes around. We really liked exploring the cafes in this area and plant to write a whole Berlin day guide soon! There is just so much to see in Gendarmenmarkt! As one of the most beautiful squares in the city, Gendarmenmarkt is understandably a bit overwhelming. This is because there is just so much to do and see here! 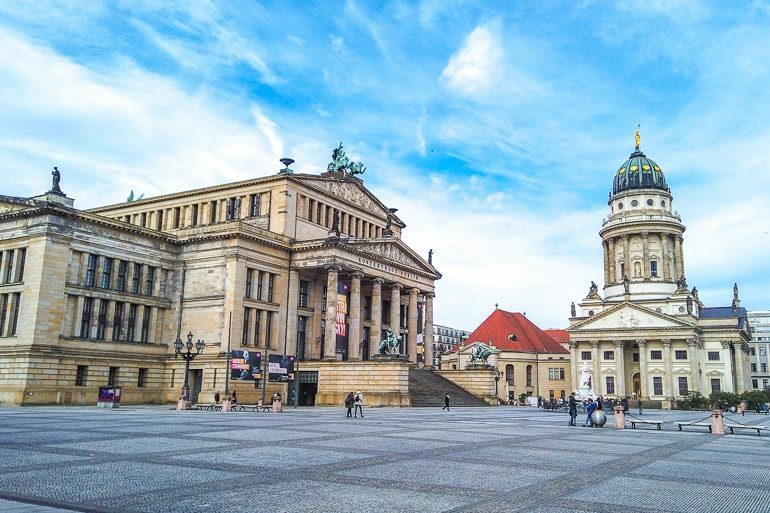 Located in the city centre to the south of Museum Island and the main street Unter den Linden, this massive open square is home to the Berlin Concert Hall (Konzerthaus Berlin), the French Church (Französischer Dom) and German Church (Deutscher Dom) at the north and south end. Funny enough, the German Church is actually not a church at all – but a museum dedicated to German parliamentary history which you can visit. The French Church is also not actually a church – but a tower – and houses the Huguenot Museum which is dedicated to the history of the French community in Berlin. From the tower, you get great panoramic views but it and the museum are under renovation currently (mid-2019). In the middle of the square, you will find a beautiful monument/fountain dedicated to the German poet Friedrich Schiller (Schillerbrunnen). In the summer, there is outdoor seating for a few cafes in and around the square while the wintertime brings German Christmas Markets to check out! You can plan a visit to the square and learn more information here. If you are interested in learning even more about the Cold War era in Berlin and the divide between East and West Berlin, then there is no better place than the Berlin Wall Memorial. Located in the north end of the city, (close to Berlin Nordhbahnhof S-Bahn transit stop), this section of the Berlin Wall is different from that of the “East Side Gallery”. This section of the wall remains largely untouched with a memorial park featuring information and a museum which gives visitors views of the best-preserved sections of the Berlin Wall. One such section is preserved with the full-barrier in place (sand, guard tower, barbed wire, etc). You can learn more to plan a visit here. The exterior of the Opera House – pretty clear that you’ve found it! Also Unter den Linden is a massive building that you cannot miss – this is because it’s also very pretty! The Berlin State Opera House, originally founded in 1742, was damaged and rebuilt after World War II. Today, the Opera House features top performances the city from ballet, theatre, orchestras, and more! If you want to see a performance while you are in Berlin, check the schedule here. The square to the west of the building is also a very important spot in Berlin’s history – as this is where you find Bebelplatz. Belebplatz is the site of the infamous 1933 book burning by the Nazi party. Today, there is an underground library you can see through a glass window – to empty shelves – which has space for the 20,000 books that were lost here. Last, but certainly not least, is the Berlin Victory Column. Visible from the Brandenburg Gate in the kind-of middle of Tiergarten, the Victory Column stands today to commemorate Prussian victory in their wars (unification wars) in the 19th century. The column was actually closer to the Reichstag but (true story) the Nazis moved it and that actually (likely) saved it from bombing in World War II. On top is a massive bronze sculpture of Victoria weighing 35 tonnes! To get to the base, you can take one of four tunnels under the road to check out the outside up-close. For a fee during open hours, you can head up to the viewing platform for great views of the surrounding park and the city! And there you have it – 15 of the most classic things to do in Berlin. Of course, we missed just a handful of things but overall we are super happy with this list. In the end, there are so many things to check out in Berlin – touristy and non-touristy so there’s always going to be something for everyone. We really like the Reichstag and the East Side Gallery – but we have more to see! You will have no problem filling up your time in the city – so let us know what you get up to!